This weekend the Boston University men’s hockey team held its first ever season opener in the month of September. The Terriers beat Union College 4-1 on Saturday night after a three-point (2g, 1a) performance from sophomore forward Patrick Harper and game-winning goal notched by sophomore defenseman Dante Fabbro. On Sunday night, BU didn’t have the same luck against the University of Prince Edward Island during its exhibition game. After five minutes of overtime, the game ended in a 5-5 draw. However, the Terriers continued to have a productive power play with four power-play goals after scoring two during opening night, and freshman forward Brady Tkachuk and sophomore defenseman Chad Krys each tallied three points. BU’s next matchup will be against Quinnipiac University in Hamden, Connecticut at 2 p.m. on Sunday (Oct. 8). Tune in to the live blog for updates. A strong 2016 recruit class for Boston University appears to have gotten even better. Defenseman Dante Fabbro has committed to play at BU, he announced via his Twitter account. Fabbro (6 foot 1, 185 pounds) was one of the most sought-after defensive recruits to have not committed to a school. Eligible for the 2016 NHL Draft, he is considered by many pundits to be a top-10 pick in that draft. 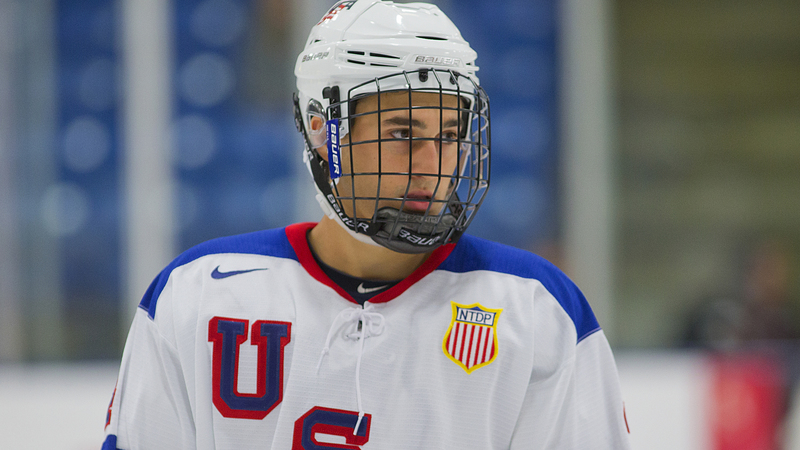 International Scouting Services has Fabbro ranked No. 8 in its October rankings of 2016 draft-eligible players. So far this season with the Penticton Vees of the BCHL, Fabbro has 10 points (three goals, seven assists) in 10 games played. He had 33 points in 44 games last year with the Vees at age 16. Fabbro skated with the Canadian U-18s during the 2015 Ivan Hlinka Memorial Tournament in August, helping the team win a gold medal. The British Columbia, Canada native had reportedly been deciding between BU, Boston College, the University of Minnesota, the University of Denver and the University of North Dakota. He is expected to arrive on Commonwealth Avenue next season, along with fellow blue liners Chad Krys and Vasili Kolias.